Martha Maxine Gregory, 94, of Norris City passed away at 5:45 a.m., Saturday, March 16, 2019 at Hamilton Memorial Hospital in McLeansboro. She was born on July 9, 1924 in Mt. Erie, IL the daughter of Frank and Julia (Scott) Chrisman. Maxine married George Estell Gregory on February 22, 1942 and he preceded her in death on October 13, 2007. While working in a sewing factory, she caught the eye of her future husband by throwing thread spools out the window as George was walking by at lunch. Maxine also pumped wells and was a homemaker. She was an active member of First Baptist Church in Norris City where she taught Sunday School and was a member of WMU. Maxine was a 50 plus year member of the Happy Face Home Extension. Maxine is survived by two daughters, Dianne Prince of Norris City and Beverly (Darrell) Johnson of Georgetown, TX; two sons, Stephen E. Gregory of Omaha and Samuel (Judy) Gregory of Norris City; seven grandchildren; 11 great-grandchildren; three great-great-grandchildren; two sisters, Marietta Enyart of Louisville, IL and Golda Mae Brent of Wasilla, AK; and a sister-in-law, Betty Chrisman of Gibson City, IL. She was preceded in death by her parents, husband, a brother Arthur Chrisman; a sister, Marie Naney; two sons-in-law, Earl Prince and Bill Henson; and a daughter-in-law, Ruthie Gregory. 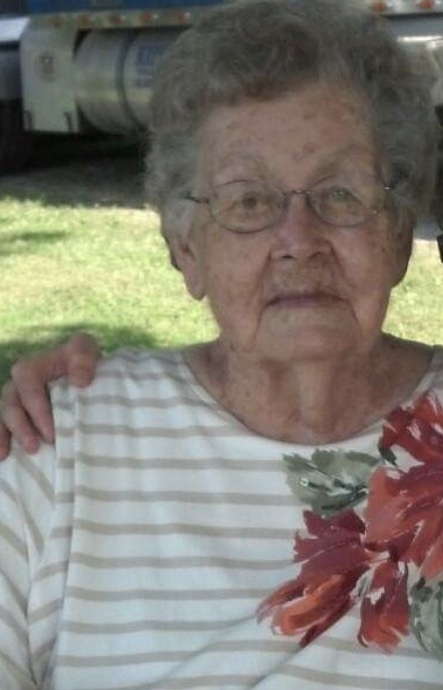 Funeral services for Maxine Gregory, 94, of Norris City will be held at 1:00 p.m. on Tuesday, March 19, 2019 at First Baptist Church in Norris City. Burial will be in Enfield Cemetery in Enfield, IL. Visitation will be held on Monday from 5:00 p.m. until 8:00 p.m. at Campbell Funeral Home in Norris City and from noon till service time on Tuesday at the church. Memorial contributions may be made in Maxine's memory to Gideons International or the Norris City Library and will be accepted at Campbell Funeral Home in Norris City.